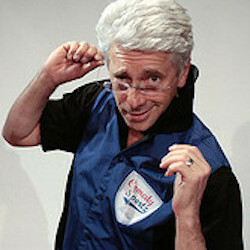 Brian Kapell is the Executive Director of ComedySportz Berlin. He has been performing improvisational comedy since 1985, as one of the founding members of ComedySportz in Madison Wisconsin. He has helped establish and manage many other theatre and improv companies around the US. He is a great lover of cheese and the Clash, although he can’t figure out a way to convince the Sandanistas to eat cheddar. He has an old Harley named Roberta and 2 sons named Benjamin and Philip. Buy him lunch sometime and he will tell you all about the different ways you can make your hair go gray.